Summer is most definitely here. It is so hot now! Well, it's hot, yes, but it's actually the humidity that lets me know summer has arrived here in Asia. It's been muggy for days now, and the moisture just builds and builds until it has to rain; which arrived today, and will continue for the rest of the week. And then the moisture will start to build again, keeping up the cycle all summer. It's tough to do anything on the really humid days, as you just feel so sweaty and lethargic, and a bit grumpy in my case about it all. But on the not-so-gross-and-sweaty days, Hong Kong is out in force, enjoying the sunshine. So, I do have mixed feelings about summer; on the one hand, the school year is nearly up, I can go travelling again, and I can spend lots of time outside in the sun. On the other, I'm going to be a sweaty mess for the next couple of months, and potentially quite grumpy about it on the days that I have to work or run errands and such, things which are so much worse to have to do in amongst the sweaty crowds here (I may or may not have just had a small temper fit over a trivial issue, because I've been hot, tired, and stressed all day). Oh, and the mosquitoes. I've got like four bites already in just the last couple of days - my legs are normally a dot-to-dot puzzle by the end of the summer. It's not all bad news of course though! Last weekend I was able to have the first proper beach day of the year. It's certainly a part of living in Hong Kong that I'm especially fond of, being able to go to the beach relatively easily. 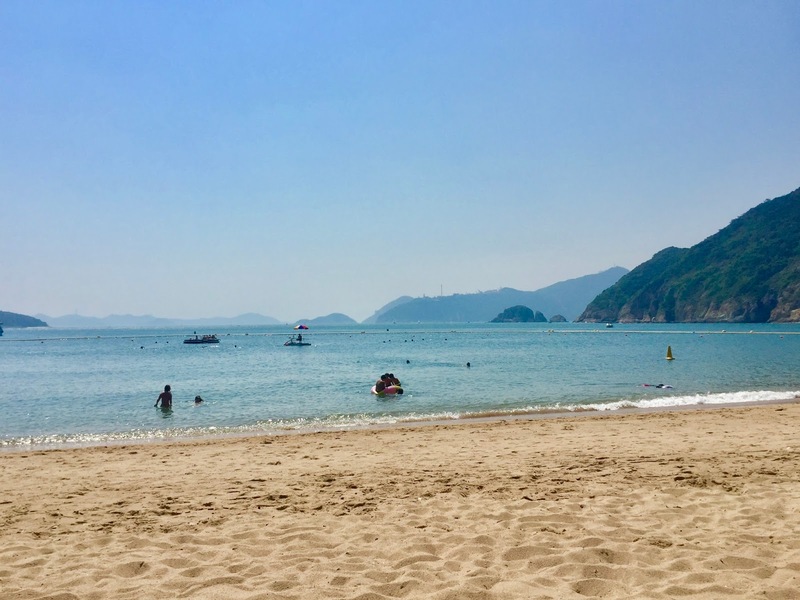 Of course, plenty of other people have the same idea on these sunny days, so a lot of the beaches get quite busy, and the traffic can be troublesome - while I can get to the closest beach in about an hour on a quiet day, it can take much, much longer when it's busy. 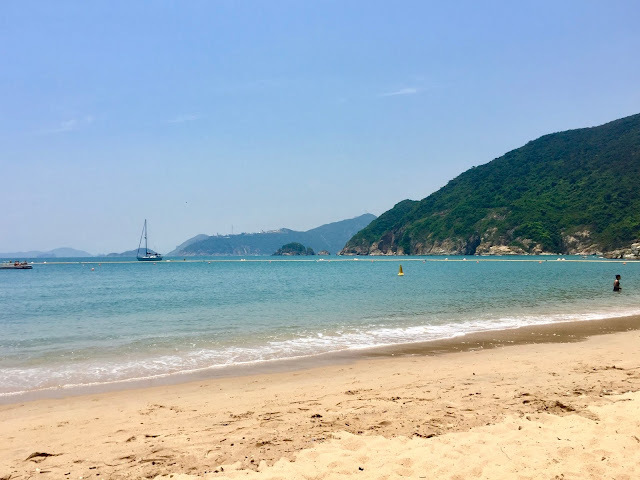 Luckily traffic wasn't too bad last week, and we were heading for one of the quieter, lesser-known beaches, Chung Hom Kok. 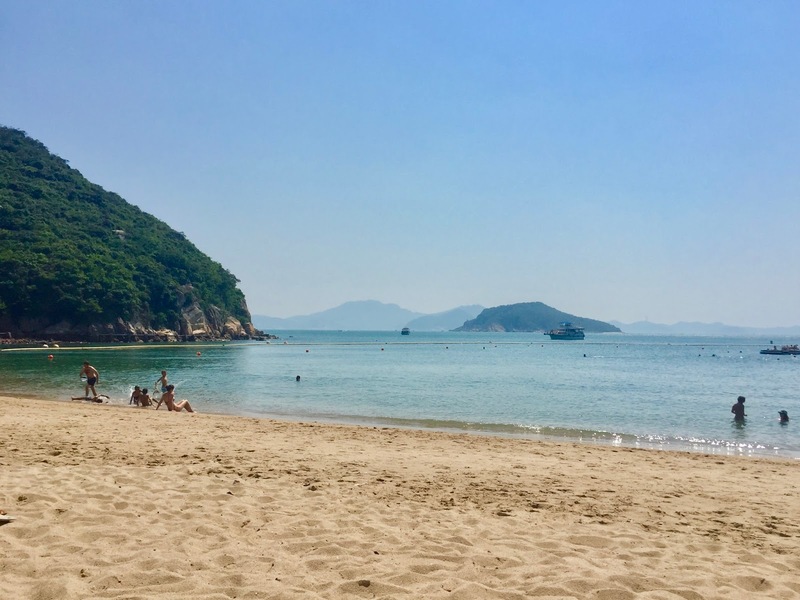 It's on the way to Stanley, on the south side of Hong Kong Island, just a bit further along from the more popular, and crowded, Repulse Bay Beach. I took the number 6X bus from Central, and there's a couple other routes that go by, or you can take a taxi from the Ocean Park MTR station. It was a very chilled afternoon, as a couple of the friends I was with were nursing pretty hard hangovers. The beach was busy but not packed, and fairly peaceful, though we could have done without the screaming child or the group singing nearby. 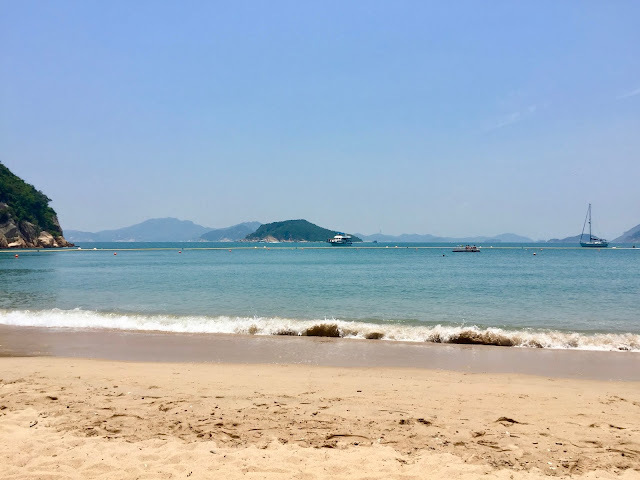 We mostly just lounged in the sun, taking a dip from time to time to cool off - I love the ocean a lot of the time, but I'm reluctant to have to travel an hour or more home while still damp, and covered in sand and salt, so I often don't swim as much here as in other places. It was also great to catch up with a friend I haven't seen in a couple of months, so we were content just chatting away. My skin definitely got a bit of a shock, as even with suncream, the backs of my legs got a little fried. It's faded already though, and I tend to do that at least a couple of times at the start of summer, before my skin gets used to the sun again. The sun is good for my skin, overall, as I tend to get fewer spots in the summer (maybe because I'm sweating out all the gunk!). I don't change my routine, and in fact am often lazier about skincare when I go travelling, but it normally works in my favour. The spots always come back when I settle (back in cities, so pollution doesn't help) though, so I have to start up my routine again. However the humidity leaves my hair feeling limp and greasy a lot of the time (although I do like how it naturally lightens over summer, for a bit of a refresher). It makes me want to wash it more, but I don't like to because that dries it out and leaves it feeling damaged. I'm a fan of salt spray year round, but it feels especially appropriate in summer - any other suggestions or recommendations? Anyways, I'm looking forward to the rest of the summer, mostly because of my upcoming travel plans - although the planning stage I'm in just now has been stressing me out a little. I need to get on and book what's left so I can stop pondering over it too much! I'm sure it will be as fun and epic as my last few summers, and I'm also looking forward to more beach days and outdoor time over the next few weeks before all that - when I'm not complaining about the humidity, crowds and sweat that is!